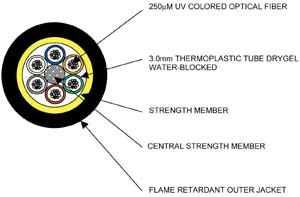 Which ones are some common fiber cable types? Distribution Cable (compact building cable) packages individual 900µm buffered fiber reducing size and cost when compared to breakout cable. 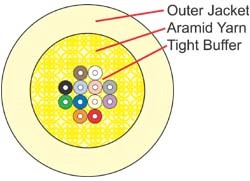 The connectors may be installed directly on the 900µm buffered fiber at the breakout box location. The space saving (OFNR) rated cable may be installed where ever breakout cable is used. 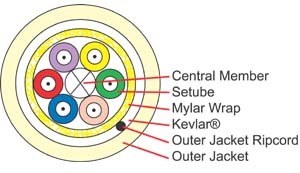 Shenzhen Genesis will connectorize directly onto 900µm fiber or will build up ends to a 3mm jacketed fiber before the connectors are installed. Shenzhen Genesis now offers indoor/outdoor rated tight buffer cables in Riser and Plenum rated versions. These cables are flexible, easy to handle and simple to install. Since they do not use gel, the connectors can be terminated directly onto the fiber without difficult to use breakout kits. This provides an easy and overall less expensive installation. (Temperature rating -40ºC to +85ºC). Shenzhen Genesis indoor/outdoor rated breakout style cables are easy to install and simple to terminate without the need for fanout kits. These rugged and durable cables are OFNR rated so they can be used indoors, while also having a -40c to +85c operating temperature range and the benefits of fungus, water and UV protection making them perfect for outdoor applications. They come standard with 2.5mm sub units and they are available in plenum rated versions. Corning Cable Systems FREEDM® LST™ cables are OFNR-rated, UV-resistant, fully waterblocked indoor/outdoor cables. This innovative DRY™ cable with water blocking technology eliminates the need for traditional flooding compound, providing more efficient and craft-friendly cable preparation. Available in 62.5µm, 50µm, Singlemode and hybrid versions. Shenzhen Genesis’s innovative line of indoor/outdoor loose tube cables are designed to meet all the rigors of the outside plant environment, and the necessary fire ratings to be installed inside the building. These cables eliminate the gel filler of traditional loose tube style cables with super absorbent polymers. Loose tube cable is designed to endure outside temperatures and high moisture conditions. 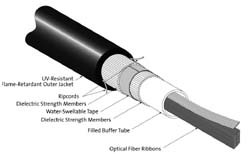 The fibers are loosely packaged in gel filled buffer tubes to repel water. Recommended for use between buildings that are unprotected from outside elements. Loose tube cable is restricted from inside building use, typically allowing entry not to exceed 50 feet (check your local codes). Hybrid cables offer the same great benefits as our standard indoor/outdoor cables, with the convenience of installing multimode and singlemode fibers all in one pull. Our composite cables offer optical fiber along with solid 14 gauge wires suitable for a variety of uses including power, grounding and other electronic controls. Low Smoke Zero Halogen cables are offered as as alternative for halogen free applications. Less toxic and slower to ignite, they are a good choice for many international installations. We offer them in many styles as well as simplex, duplex and 1.6mm designs. This cable is riser rated and contains no flooding gel, which makes the need for a separate point of termination unnecessary. Since splicing is eliminated, termination hardware and labor times are reduced, saving you time and money. This cable may be run through risers directly to a convenient network hub or splicing closet for interconnection.